If you go peaking around my blog, it won't take you very long to find that I am a bit of a foodie. In fact, before having a child, there was a time when I had more pictures of food on my phone than people. Who can relate? I just really appreciate good food, and even more so, I appreciate good food that is good for you. That's why I am so excited to share a little bit about my new obsession: ThinSlim Foods. 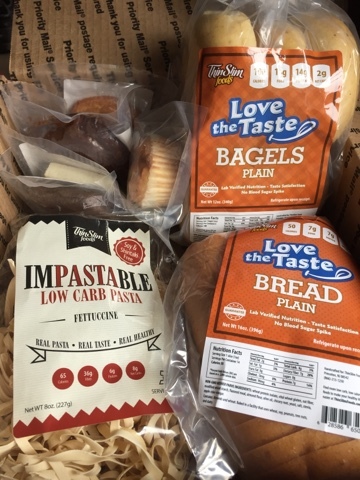 ThinSlim Foods crafts, ounce per ounce, the lowest calories, lowest carb, lowest Smart Point breads, bagels, pasta, muffins, brownies and squares while using the highest quality ingredients (like olive oil, oat fiber, etc.) and it all tastes so, so good. ThinSlim Foods are so good that I'm actually putting the *ThinSlim Sampler Pack on my Christmas list this year. Sometime last week, my first ever ThinSlim Foods Starter Pack arrived at my door and since then, my mind has been forever changed about what "low carb" and "low calorie" food tastes like. I decided to have two slices of the bread as a mid-morning snack, un-toasted, just so I could really taste all that it was, in it's natural form. 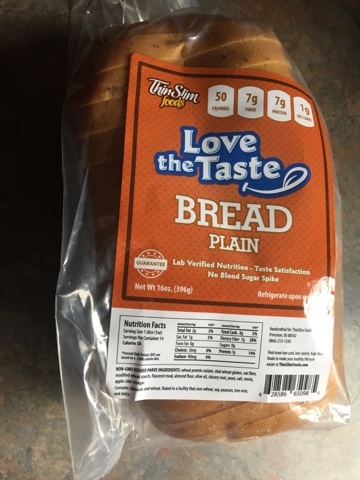 I was so surprised at how fresh and homemade this bread tasted, that I actually took a second look at the nutritional facts and ingredients. 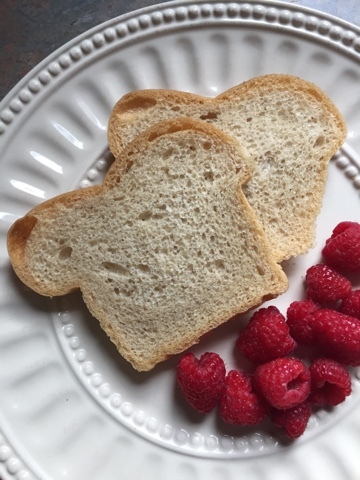 ThinSlim's bread is only 50 calories a slice and with only 7 grams of carbs, it's a miracle. The bread tastes fresh and homemade, which is my favorite kind of bread. Getting the homemade taste of bread without going through all of the trouble of making it, was a real win for me. The other morning, the unimaginable happened. I had an entire ThinSlim bagel for only 100 calories. You guys, did you read that last sentence? 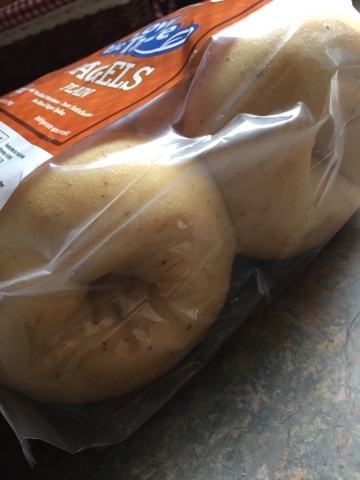 ThinSlim Foods' bagels are ONLY 100 CALORIES, and they taste great! Can I get an Amen? 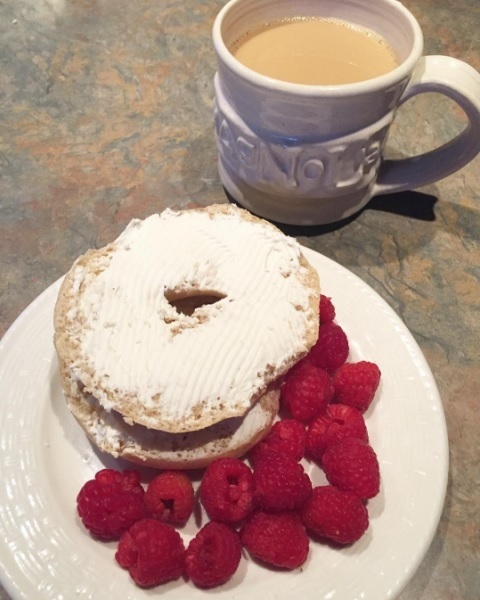 I love bagels and since ThinSlim's bagels are so low calorie, I can actually eat an entire bagel with my breakfast without feeling guilty! I am going to be a regular ThinSlim bagel girl from here on out. Last but not least, let me tell you about the pasta. Pasta is another thing that I often make homemade because, let's be real, not much can beat the taste of fresh, homemade pasta. 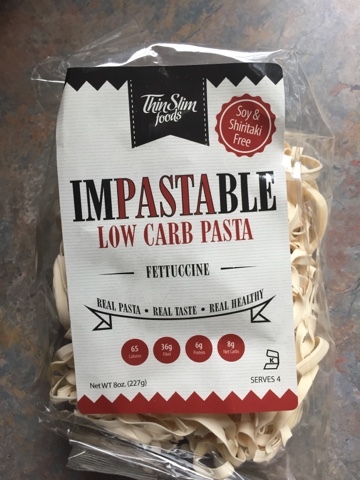 However, ThinSlim's "Impastable Low Carb Pasta" can no doubt bring a nutritional value that I can't compete with on my own. One (2 oz.) serving of ThinSlim's fettuccine is only 65 calories and has 8 grams of carbs. Can I also add, the amount of fiber that ThinSlim is putting in their products is seriously unbelievable (in the best way). Just from eating a portion of their pasta, I ate more fiber in one meal than I had the previous day in all. 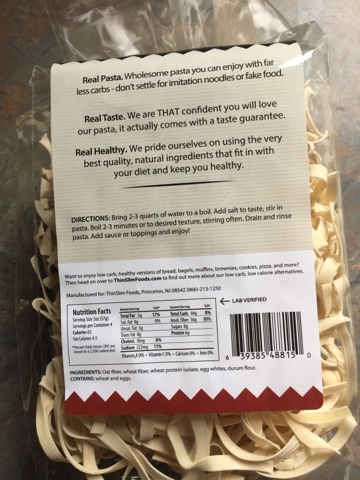 No wonder this pasta is so filling! ThinSlim's Starter Pack was such a good find for me. 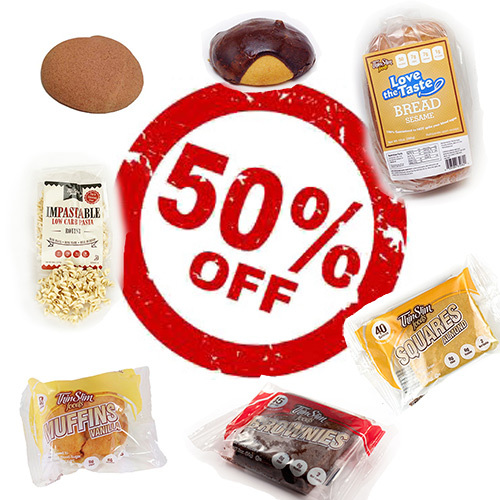 Not only does starter pack have pasta, bagels and bread but there are a lot of sweet treats in the pack, as well. I'll share all about what I thought of those sweet treats, tomorrow. Disclosure: I received the ThinSlim's Starter Pack as part of an affiliate collaboration. As always, all opinions here are my own.